For over six decades, WHCO has been proud to serve the communities of Southwestern Illinois. Our miss ion is to entertain, to inform, and to provide a valuable voice to the communities between Saint Louis and Carbondale. Long after our founding, the station continues to strive to be the best local radio possible for the residents of the area who rely on our service each day. Founded in 1955, the station was originally owned by Oscar C. Hirsch, and was part of a group of stations that included KFVS-TV 12, the CBS affiliate in Cape Girardeau, MO. In the late 1980’s Hirsch sold WHCO to a Randolph County group led by Jack L. Scheper, who had served as the station’s manager since 1959 and founded the flagship People Speak public affairs program in 1961. Jack passed the station onto his son John in 2008; Jack would pass on in November of 2009. John departed the station in early 2010 to pursue other opportunities and spend time with his family. The voices that have danced across the area’s radios at 1230 kilohertz became the friends of many throughout Southwestern Illinois. For over forty years, Jack L. Scheper hosted the People Speak program each weekday morning, talking with the guests ranging from the top politicans to your neighborhood church group. He also played the role of Santa Claus during the holiday season, reading the letters sent to the North Pole on the air weekday afternoons. Mike Arnold Hoefft was the first voice many residents heard when he cracked the mic before 6:00 am for the Morning Journal, and he spent lunch with them on the Noonday Journal; anglers and hunters relied on his stories and advice on the Sportsmans Corner report. Dan Schnoeker and Dennis Stork reported live from gymnasiums across Southern Illinois and all the way to Champaign, broadcasting the state basketball finals live each March, a tradition that carries on to this day. Live at the state finals in Champaign. Mid/late 1980s. Dan Schnoeker on the left; Dennis Stork on the right. Sometime the voices were yours: children growing up in the area have a chance to pop into the Christmas Tree Club and say hello to friends and family. The program also serves to bring toys into the homes of the needy during the Christmas season. For years the annual Easter Seals Radiothon featured the talents of the local community during the all-day event that raised over 100,000 dollars over the years to help the Rotary Club with their efforts. 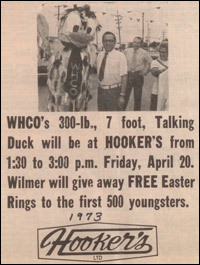 WHCO mascot Wilmer the Duck out on the town. Over the years, WHCO has evolved over time to better meet the need of needs of the community. 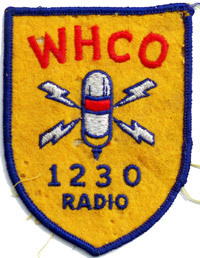 From our origin as a country station, WHCO eventually evolved into playing Top 40 and adult contemporary music, all the while remaining a Full Service outlet devoted to providing up-to-date news, weather and sports as well as talk programming that gave local residents a change to have their voice heard. In 1998 WHCO switched to a News/Talk format, bringing in hosts such as G. Gordon Liddy, Larry King and Jim Bohannon to join the legendary local talk program The People Speak. In 2008, WHCO returned to its roots with a mix of great Real Country music and full service news and talk programming to best serve the listening area. To this day WHCO is proud to be the source for news in the surrounding communities, offering a public forum for local leaders on the People Speak and keeping residents of the area up-to-date throughout the day with breaking news, severe weather updates, cancellations and anything else of local importance. We’re also proud to be the sports voice of the region, with comprehensive coverage of high school sports contests plus live coverage of the Cardinals, Blues, Fighting Illini and more. For more information about WHCO’s broadcast schedule, check out our schedule and programs page. To provide feedback about WHCO and/or our programming, head to the contact page.